21-Aug-2016 -- This Degree Confluence Point had been on my radar for several years. I had thought about visiting it last May, when I made a road trip to visit several other points along the 119 Degree West line of longitude. However, back then I was worried that parts of the ‘dry’ lake bed might not be quite dry enough to drive on. I knew, however, that the dry lake bed would be drivable towards the end of the Summer, but I wanted to avoid the week before Labor Day, when the annual “Burning Man" festival takes place on the lake bed. Therefore, I chose this day (while driving to Colorado for a mountain biking trip) to make a detour to visit this point. Just beyond Double Hot Springs - at 41.05120°N 119.02557°W - a 4WD dirt road continues south, towards the Degree Confluence Point more than 3 miles away. After passing beside Casey Hot Springs (which was overgrown during my visit), the road passed within 0.7 miles west of the point. From there, it was an easy hike across the desert - albeit in temperatures of more than 100° F (38° C) at the time of my visit. 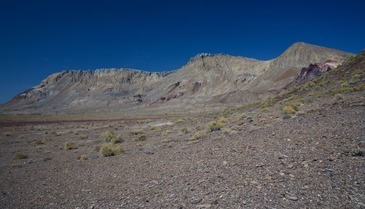 The point lies just on the eastern edge of (the western arm of) the Black Rock Desert, as the flat ground starts to rise towards the hills to the east. Black Rock Peak - for which the Black Rock Desert is named - is visible to the South. Here is a remote-controlled aerial video of this confluence point.